Cambridge, UK and Pittsford, NY – 25 May 2011: Growing global demand for biotech and chemical plant expertise is forcing a rethink of efficiency in plant design. At industry conferences across Europe, CAD Schroer’s engineering design experts are showing visitors a flexible, productive way forward.Strong global demand for new production and process plants has increased project competition between traditional plant contractors and newer services providers. Many engineering departments, keen to maximise quality and efficiency, are stepping on from 2D or 3D mechanical CAD software. They are looking for a mid-market 3D solution ideally suited for flexible large-scale plant design -without the big implementation burden associated with some complex plant engineering systems. At the PCH pharma and chemical industries convention in Lyon, France, and the FDBR piping technologies conference in Stuttgart, Germany, engineering software experts CAD Schroer presented their perspective on efficient plant design and factory layout. 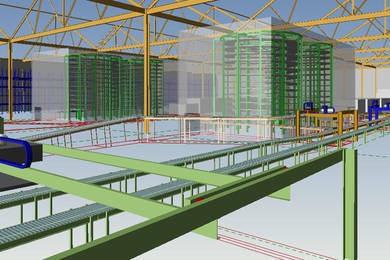 MPDS4 straddles the gap between 2D to 3D factory layout and full plant design. 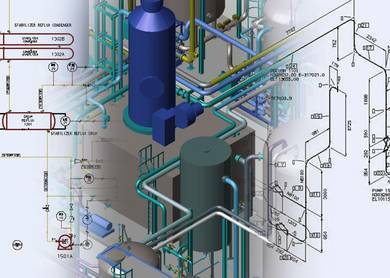 It delivers flexible catalog-driven applications for large-scale layouts, whether the focus is on 3D factory buildings based on 2D layouts, with fast auto-routing of conveyor lines; or intelligent 3D pipe routing with vessel, HVAC and steel design in complex chemical plants. PCH and FDBR visitors saw a huge benefit in moving from 2D concepts to 3D building design to fully-fledged piping and plant design with one integrated, flexible, large-scale design tool. 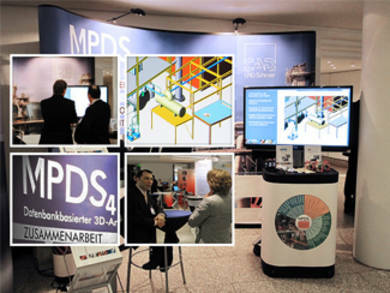 CAD Schroer will be attending many other digital plant, engineering and water technology events this year.